Braylen Seals hit six consecutive pressure-packed, free throws down the stretch to secure No. 5 Tucker Tigers 52-46 Class 6A boys’ state semifinal victory over the Heritage-Conyers Patriots at West Georgia University in Carrollton on Saturday. 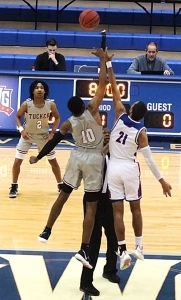 Tucker (28-4) and the Patriots (17-13) played a back-and-forth game over the first three quarters. Heritage led 9-8 at the end of the first quarter with Tucker taking a 19-18 lead into the half. Tucker held a slim 30-29 lead going into the fourth quarter. Nate Ogbu hit a pair of free throws with 2:38 to play as Tucker extended the lead to 46-40 heading into the final two minutes. Heritage trailed 48-40 with 54 seconds to play after the first two of Seals free throws. The Patriots managed to close the gap to 48-46 with 20 seconds to play when Seals hit two more free throws to make it a four-point Tiger lead at 50-46. Seals would go to the line with 10 seconds to play and hit two more free throws to put the game out of reach. The 19 points by Seals in the game led the Tigers and Ogbu contributed 17 points, 11 rebounds and 4 blocks. Jermontae Hill had 8 points to go with 10 rebounds and 2 blocks. 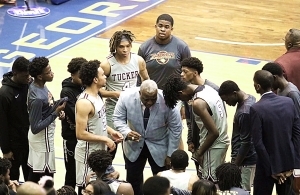 Tucker moves into the Class 6A state title game at 3:00 pm on Saturday against the Tri-Cities Bulldogs (23-6) which defeated Brunswick 83-74. The game is set for the Centreplex in Macon. It will be Tucker’s seventh championship appearance including state titles in 1996 and 2007.